If you’ve recently purchased a Tesla model, you’re probably beyond excited. You’re not just helping the environment, you’re bolstering the future of transportation. In order to use your new electric vehicle, you’re going to need a home car charging station. You don’t need to look further than Divine Electric Norcal to find the high-quality EV charger installation you need. Who should I hire to connect my new Tesla? Will a new home car charging station require a major electrical re-wiring? How fast do I want my Tesla to charge? You can rest assured Divine Electric is prepared to educate, quote multiple solutions and help you get started on your EV charging station journey immediately. Why Choose Divine Electric Norcal as Your Go-To Local Electrician? We’ve been Tesla Certified since 2017. Not only is the owner of Divine Electric Norcal Tesla Certified, but every one of our technicians and managers is personally Tesla Certified to ensure a safe and reliable charging system for every project we work on. Additionally, we always have Tesla home car charging units(known as “wall connectors”) in-stock, these EV chargers can be programmed to match your desired charging speed based on the site of your dedicated circuit. Our team is dedicated to providing customized, relevant solutions based on each customer’s particular needs and their home’s electrical system. Not to brag, but we are “Marin County’s #1 rated electrician on Yelp” and we’ve been voted “Best of Marin in 2018”, in Pacific Sun Magazine by our beloved community. We look forward to serving both returning and new customers whenever we can. Who Should I Hire to Connect My New Tesla & Will a New Home Car Charging Station Require a Major Electrical Re-Wiring? Compliance with all local and national electric code installation requirements. Home electrical load calculated to ensure safe and reliable installations. Reporting of all completed Tesla charging projects back to Tesla’s database. A faster charge doesn’t cost any more than a slower charger with regards to your Pacific Gas & Electric bills. 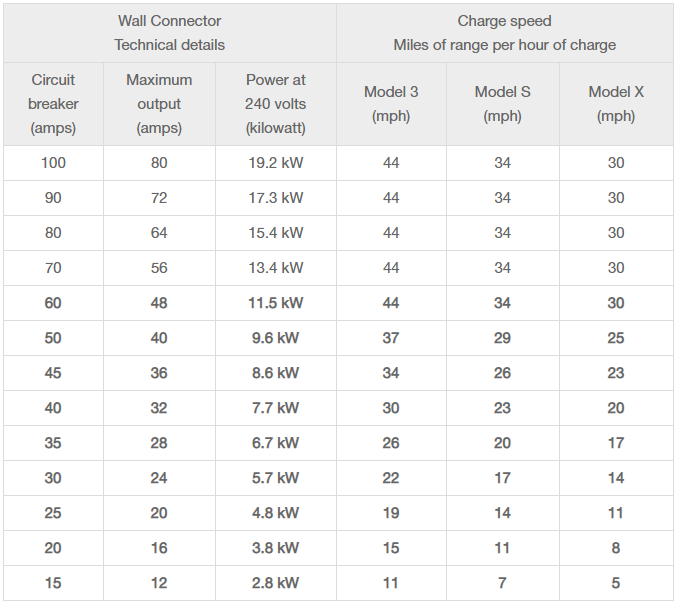 Tesla’s vehicles can recharge by using your choice of two Tesla’s charging units: the Mobile Connector, which recharges at speeds of 20-30 miles per hour (32 Amp maximum /240 Volt) and their Wall Connector, which recharges at speeds of 44-52 miles per hour (80Amp maximum /240 Volt). Consider the distance of your daily commute and driving activitie and then how long you’re willing to wait for the vehicle to recharge. Is My Home Properly Able to Support a Tesla (or Any Other Electric Vehicle)? We properly evaluate your home’s electrical system by completing a home load calculation to ensure the reliability of your home and new vehicle’s power supply needs. If an electrical panel upgrade is required, our technicians will provide you with an instant quote for the added investment. We don’t want you to plug your new vehicle in only to find other problems with your electrical wiring in your home. We’re not just your home car charging station installer, we’re still you’re local electrician. Beyond a proper electrical system, most electric vehicle owners consider adding a surge protection unit to the home’s electrical panel. A surge protection unit offers 24/7 protection against harmful voltage entering the home and vehicle during winter storms, falling trees, and electrical grid maintenance. It’s probably in your interest to invest of one of those too while you’re at it. Reach out to us to schedule your EV charging installation in Marin County now rather than later so that you can get in that smooth, leather Tesla seat and get out on the road.